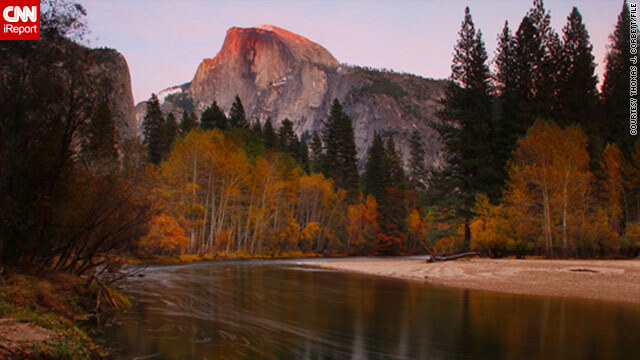 The granite Half Dome rises 4,800 feet above eastern California's Yosemite Valley, and about 8,800 feet above sea level. A California woman fell 600 feet to her death Sunday while trying to descend a landmark rock formation at Yosemite National Park, according to park officials. Hayley LaFlamme, 26, of San Ramon, had hiked with three other people to the peak of Half Dome, a granite formation that rises about 4,800 feet above Yosemite Valley in eastern California. She was descending the cables area - the dome's highest 400 feet, where hikers hold onto fixed metal cables - when she fell, park officials said Monday. One of her companions called 911 about noon to report the fall, park spokeswoman Kari Cobb said. Park rangers pronounced LaFlamme dead when they found her body, the park said. 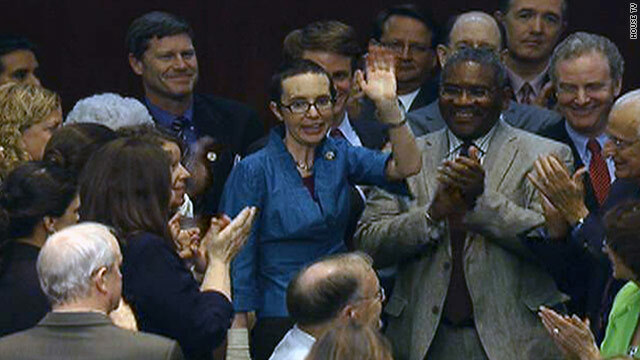 U.S. Rep. Gabrielle Giffords came to the House floor during Monday evening's vote -- the first time she appeared in the House since she was shot in January. "I have closely followed the debate over our debt ceiling and have been deeply disappointed at what’s going on in Washington," Giffords, D-Arizona, said. "After weeks of failed debate in Washington, I was pleased to see a solution to this crisis emerge. I strongly believe that crossing the aisle for the good of the American people is more important than party politics. I had to be here for this vote. I could not take the chance that my absence could crash our economy." Her statement noted that she didn't vote for a debt-limit increase in December 2009 and February 2010. It said that Monday's vote was different, arguing that the strength of the U.S. economy was hanging in the balance. Giffords had been away from the House since she was shot through the head during a meeting with constituents in Tucson. She was released from inpatient rehabilitation at a Texas medical center in June. Six other people, including one of her aides and a federal judge, were killed and 12 others were wounded in the Tucson attack. [Updated at 7:39 p.m. ET] The U.S. Senate is now expected to vote on the debt-ceiling compromise bill on Tuesday at noon. The House passed the bill 269-161 earlier this evening. One of the representatives who voted yes was Gabrielle Giffords, D-Arizona, who cast her first vote since she was shot in Tucson in January. The two-stage deal reached Sunday by President Barack Obama and congressional leaders calls for $2.4 trillion in savings over the next decade, although the the Congressional Budget Office pegs the savings at $2.1 trillion. It also authorizes an increase in the nation's borrowing limit through the end of 2012. A special congressional committee to recommend long-term fiscal reforms is also part of the package. In the first stage, $917 billion in spending cuts will be accompanied by a $900 billion increase in the debt ceiling. A special joint congressional committee would recommend a further $1.5 trillion in deficit reductions. If approved by the full Congress by year's end, Obama could raise the debt ceiling by $1.5 trillion. If not, the ceiling could rise by $1.2 trillion, but doing so would trigger matching mandatory across-the-board spending cuts likely to be unpopular with both parties. The legislation needs to reach Obama's desk by Tuesday at the latest, according to the Treasury Department. If the current $14.3 trillion debt limit is not increased by that point, the federal government wouldn't be able to pay all its bills on time, and Americans could face rapidly rising interest rates, a falling dollar and shakier financial markets, among other problems. [Updated at 7:34 p.m. ET] The final tally of the House vote was 269-161 in favor of the debt-ceiling compromise bill. Sixty-six Republicans and 95 Democrats voted no. The bill goes to the Senate, which is expected to vote Tuesday. Filed under: Barack Obama • Budget • Economy • Politics • U.S.
As of August 2012, women with health insurance will no longer face hefty co-payments for birth control and other preventive services. The U.S. Department of Health and Human Services is requiring insurance companies to cover these services free. While most CNN.com readers welcomed the news, a few expressed fear and resentment that their own premiums would rise. amphipathic said, "If this results in fewer children being supported by welfare and Medicaid, I'm all for it." SciFiChickie said, "YES! Now I don't have to pay a $45.00 a month co-pay for birth control anymore. YEAH!" Danielle78 said, "Maybe now I can afford to get insurance since I will have freed up the $1,500 dollars for birth control. But they need to make this in effect sooner than a year, so pharmaceutical companies can't jack the price up, making them unaffordable to almost everyone." Alyssa0411 said, "Nothing is ever free. Other people will be footing this bill." hades65 asked, "What is the price for birth control pills?" blakdayz said, "Four dollars at Walmart for any generic." kauppily said, "$15-$150 a month, depending on your insurance and the brand you prefer. A lot of brands don't come in generic for BC." CEW said, "This will save money. 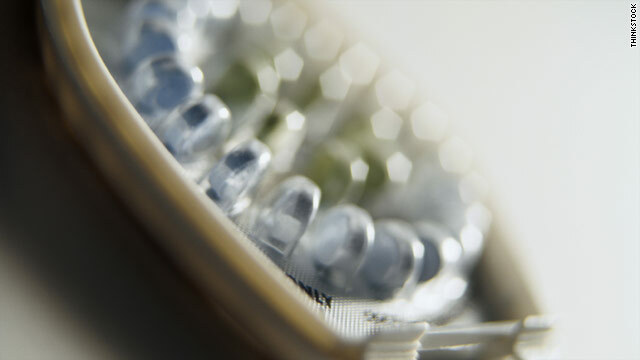 Birth control is far cheaper than paying for a baby. For years, my insurance would not pay for birth control, but WOULD pay for as many babies as I could squeeze out. They will also save money because fewer children and babies will be added to the plan." RichieP said, "You're delusional. The insurance companies have been in this business for longer than you can imagine. They do everything they can to lower their costs and increase their profits. If it saved money to pay for birth control they would have been paying for it ages ago." CEW said, "So, wait a minute. It's not OK to pass the cost of BC into the premiums, because that's costing other people money, but it IS OK to have an unwanted child, pass the cost of the birth, and then the health care of that child on to the premiums? Get a grip. Preventing babies is FAR cheaper than paying for them." skarrlette said, "These women are paying their own insurance. And we have to subsidize plenty of things we don't want to. Like fat people and their diabetes." 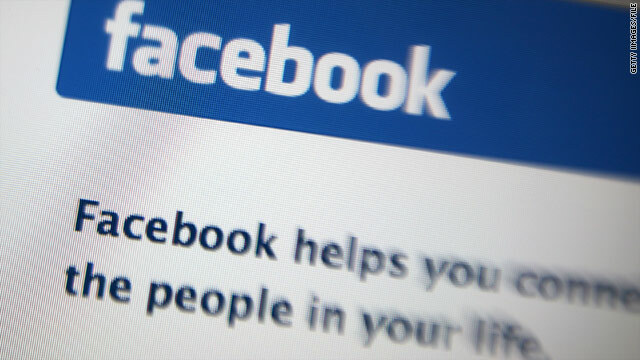 A new Missouri law makes it a crime for teachers and students to contact each other privately via social networking sites. The bill, sponsored by Sen. Jane Cunningham and signed into law by Gov. Jay Nixon, is set to take effect August 28, about two weeks after the school year has started for the majority of Missouri schools. Cunningham was quick to point out Monday that despite what was being circulated on the Web about the law it didn't stop teachers from talking to students online. Filed under: Facebook • Missouri • Technology • Twitter • U.S.
A female body was found Monday in the Connecticut River near where authorities are looking for a missing 11-year-old girl named Celina Cass, according to Essex County State Attorney Vincent Illuzzi. The body was found near a hydroelectric plant, near Stewartstown, New Hampshire, Illuzzi said. The New Hampshire Medical Examiner is on the scene. The girl's parents told authorities their daughter was missing when they went to wake her up Tuesday morning, WMUR reported. Global news outlets and blogs in Asia have focused this week on a young woman who graduated top of her class at a prestigious college in Singapore. Except they aren't raving about the student's accomplishments. They're abuzz with a bad word she dropped in her graduation speech, according to Singapore's Straits Times. "We f–king did it!" Trinetta Chong exclaimed to congratulate her peers at Nanyang Technical University's 2011 graduating ceremony. The 23-year-old's remark came after what a local reports called a "rousing" six-minute speech. A video of the speech was uploaded to YouTube on Friday and viewed, as of 12:30 p.m. ET Monday, more than 4,000 times. Chong has apologized for the remark as has the school, according to Yahoo Singapore. "(The line) really reflected how I felt at that time, and I think it resounded with other students from our graduating class too," she said. There may be little reason to worry about her or the graduates of NTU. The Straits Times recently published a story focusing on another graduate of the school who is making $20,000 a month. 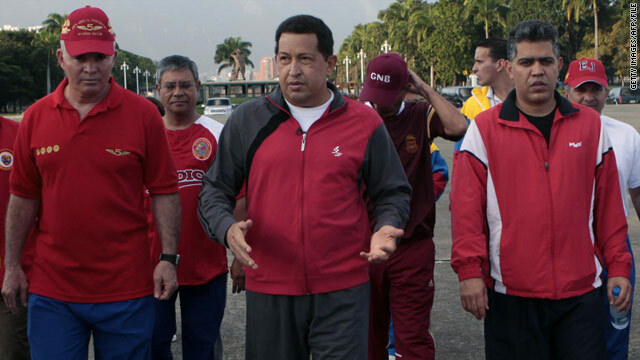 President Hugo Chávez is shown in July at a military academy, where he worked out as part of his recovery. Venezuelan President Hugo Chávez has released a workout video to demonstrate that he is healthy enough for re-election. Having recently returned from Cuba, where he received chemotherapy for an unspecified type of cancer, Chávez has told state-run media in Venezuela that he has no intention of dropping out of the running in next year's election. Chávez has been president since 1999. In the video, Chávez adopts the dress and demeanor of a typical phys. ed. teacher. He leads members of his Cabinet in stretches, some calf raises and a brisk walk while denouncing cholesterol as a poison. According to an article that was released Friday on Chávez's website, the video was originally aired by Venezolana de Television, Venezuela's state-run television channel. Speaking of his chemotherapy in July to VTV, Chávez said, "It was hard, but my soldier's body was able to withstand the small discomforts of this difficult treatment." 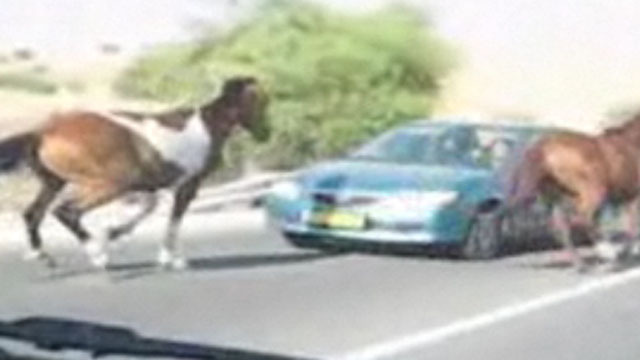 A horse leaps onto a moving vehicle, startling the driver. Driving can be dangerous, but it's not just distracted drivers or speeding-ticket dodgers that makes it so tricky. Sometimes road hazards can turn into near-death experiences. A piece of wood can become a dangerous projectile or a sneaky snake could ruin your summer travel plans. You've gotta watch how these windshield worries more than interrupted a few road trips. 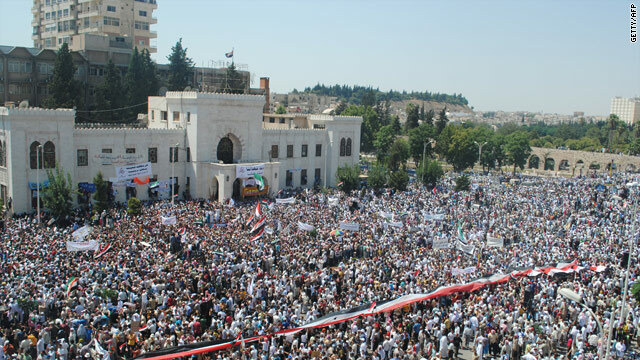 Syrians demonstrate against the government after Friday prayers in Hama. Gunfire in Syria - Activists said shots erupted again in the Syrian city of Hama on Monday, a day after more than 70 people died in clashes across the country, including at least 50 there. CNN was unable to confirm the death tolls independently. There has been little break from the violence that has racked Syria for months as anti-government protesters have opposed President Bashar al-Assad's regime. Hama is considered the center of revolt. Decision soon on U.S. hikers - An Iranian court could issue a verdict within a week in the case of two American hikers who have been held in Iran for nearly two years, the hikers' attorney said Sunday. The hikers were arrested and accused by the Iranians of crossing into the nation illegally and being spies. Attorney Masoud Shafiei, who represents Josh Fattal and Shane Bauer, argued Sunday that his clients were innocent of charges. A third hiker, Sarah Shourd, was released last year due to medical reasons. "We can still appeal this decision if we disagree with it. But I am hoping for the best," Shafiei said after Sunday's hearing, which was the last court proceeding in the trial. North Korea reiterated its call Monday for a resumption of six-party talks without preconditions, its state-run news agency reported from Pyongyang. The call follows a rare visit to the United States by North Korean Vice Foreign Minister Kim Kae-Gwan, who met with senior U.S. officials last week. It was the first direct meeting between North Korean and U.S. officials since North Korea pulled out of six-party talks in 2008. In addition to the United States and North Korea, the six-party talks involved China, Japan, Russia and South Korea. The goal was nuclear disarmament on the Korean peninsula. North Korea has called for the resumption of six-party talks without preconditions before. The United States and South Korea, however, have insisted on some tangible demonstration that North Korea is serious about denuclearization. It's been nearly four decades since a man calling himself Dan Cooper jumped out the back of Northwest Orient Flight 305, somewhere between Seattle and Reno, Nevada, carrying a parachute and some $200,000 in pilfered money. It's not known where Cooper landed, or if he even survived the jump. But the case lives on in infamy, what the FBI calls "one of the great unsolved mysteries" in the agency's history. The FBI "reignited" the case in 2007, releasing for the first time a number of pictures and information on the case. Now, agents are working a new lead and looking at a new suspect in the 1971 hijacking. The votes come one day before the United States faced the prospect of an unprecedented default on the nation's debt. It follows several weeks of stop-and-start, high-stakes negotiations, nail-biting votes in Congress and stern warnings from all sides about the calamitous effect of inaction. Obama announced the deal in an unscheduled appearance in the White House briefing room at 8:40 p.m. Sunday. News that political leaders appeared to have broken an impasse soothed frayed nerves and almost immediately buoyed global markets. "There are still some very important votes to be taken by members of Congress, but I want to announce that the leaders of both parties in both chambers have reached an agreement that will reduce the deficit and avoid default," the president said. White House officials told CNN that congressional leaders worked hard to reach a deal, but declined to say whether they had been given assurances that the leaders had the votes to deliver its passage.